It’s been a month now since I completed the London Marathon. I’m still digesting, analysing and generally getting to terms with the whole thing. People keep reminding me that I’ve run a marathon. Which is great, except that technically I ran most of the 26.2miles, but walked several bits towards the end. Not that this bothers me or makes me feel like I didn’t do my best, but it’s an important point and one I am very aware of. I don’t feel that I’ve completed a marathon. It’s almost like it didn’t happen. I did try how to explain how it went and put into words the noise, crowding, and intensity of the thing in my London Marathon review post. And now, the more I consider it, the more I think that because I didn’t feel part of it at the time (because it was all too big and overwhelming and there was too much sensory input for my boor brain to compute), it makes sense that I don’t feel like I’ve run a marathon. How can I have memories of something I didn’t feel part of at the time? And another thing has occurred to me – the monotony of the flat, urban course did not help. Running puts a lot of stress and strain on the body – it is repetitive enough as it is – but doing it for 5.5 hours and all on the flat makes it worse still. I think that’s why I walked a lot towards the end – my body just needed to feel a slightly different movement, to allow for a bit of easing off. I probably should have stopped to do some stretches. What this all adds up to is that my head is still a bit mashed and I have absolutely no emotional connection to that day. I enjoyed it in many parts. But I still recoil in near horror at some bits. In particular – a group of women outside a pub who were encroaching on to the road, Champagne in hand, leaving us weary runners very little room. I could have smacked them, not only for making me feel boxed in, but for having the nerve to stand there with such delectable refreshments that I could not have! I am now also a bit annoyed at the marathon for stalling my progress – I am definitely getting slower at the moment! On the one hand I don’t mind too much as mass road races where I chase a time are falling out of favour with me anyway, but on the other hand I would like to set at least a couple of PBs this year! But I do have to remember that a month isn’t really a very long time in terms of recovering from a marathon. I still get very tired quite quickly on days after running and I need to work on putting more good things into my body to help it get back on track. Although I have been continuing my usual road and towpath runs out of necessity, what I really crave is greenery, hills and changing terrain. Which is why recent races like the Hot Cross Run and Bluebell Trail have been so damn brilliant, and why I’m running the Ilkley Trail Race next week. Marathon distance remains a challenge and a source of huge excitement for me, and for this I am very grateful. I LOVED my long runs in training and am very glad I have already signed up for another marathon. I will be doing Kielder Marathon in October, which is an incredibly scenic, and hilly, route around Kielder Lake in Northumberland. It will be quiet and pretty and so not dull. Training starts next month – the countdown is on and this makes me very happy! 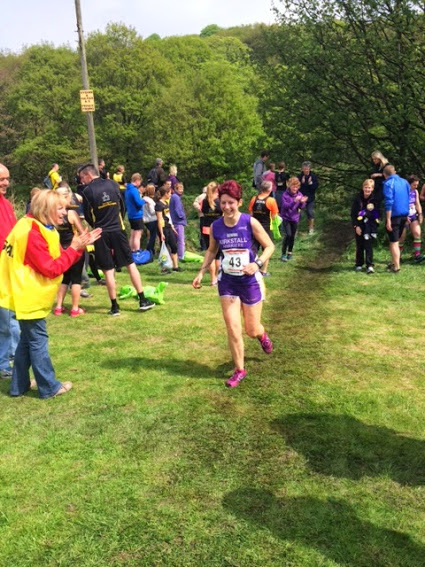 Bluebell Trail is a 10mile race organised by Stainland Lions. It was one of those that I signed up for months in advance because it just sounded so lovely, and didn’t train specifically for because it was a) ages away and b) only 10 miles(!). The day dawned soon enough, and was actually pretty decent for running. But on arrival (thanks to a lift from the ever-lovely Glover-Longfellow trio) I wasn’t really feeling up for it. I still don’t know why – I just wasn’t in race mode and could quite happily have gone back to bed and stayed curled up all day. There was no real doubt that I would run, of course, and I’m glad I did, but neither my heart nor my head were really in it at first. The start of the race heads up into the woods and early on you go through a little gap in a wall, so we had a bit of a wait at the back, but the pack soon spread out again as we ran on. I turned on my feet, put them in charge and gave the instruction: “find your way”. I detached my legs from my mind so my muscles could concentrate on what they had to do. I filed my brain away and let my mind go where it wanted. I sang to myself, did some writing in my head (this blog post mostly), meditated and simply enjoyed the sights, sounds and smells. I soared up to the tops of the trees and the hills to enjoy the views. I thanked the birds as they cheeped and cheered me on. I leapt about in time with the bluebells and the dandelions. It was all incredibly joyful. Almost as soon as I started I felt much better, and the further I ran the better I felt (as is usually the case). The route and terrain was quite varied – forest, towpath, road, cobbles, field, muddy track and even river bed! Happily, I felt that I was running really rather well. Having told my body what it needed to do and allowed my mind to go where it pleased I was able to switch off where necessary and switch on where necessary. I felt that my form was good and that I adapted to the different terrain without too much hard work. Even the massive hill of Trooper Lane didn’t faze me. I knew about it before signing up and it hadn’t put me off. I don’t mind hills. I don’t train on them enough, but I do what I can whenever I meet them. When I see a big hill in races (that is, when I can’t see the top of it) I walk. Or rather, I march. I’ve never been a slow walker, so when it comes to hills I am better off marching up than huffing and puffing and trying to keep to a run, which will inevitably become a jog-shuffle anyway. So I smiled when I saw the Trooper Lane sign at the bottom, changed gear and kept my head up. I overtook several people marching up there, and stopped to enjoy some spectacular views over Halifax. And at the top, after a cup of water, I was able to get straight back into running. You can see what all the Trooper Lane fuss is about on this blog I came across: The Hell of the Worth. It wasn’t quite all downhill after that – we were up and down right until the last mile, and there were many more tricky bits with loose rocks, muddy, narrow paths and so on. The section through the bluebell woods was absolutely stunning – they were everywhere and looked and smelled gorgeous. It was quite magical. 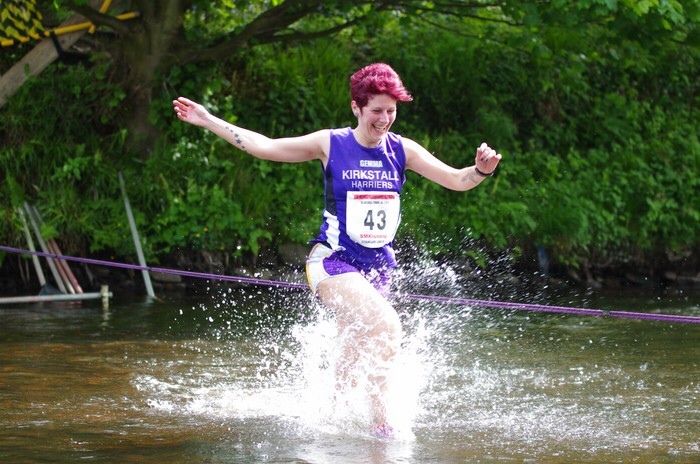 As I came back down on to the canal towpath for the final stretch I was rather warm and incredibly happy – and what better way to cool the legs and celebrate a gorgeous run out than by splashing across a river?! It wasn’t very deep so I wasn’t scared (I have a bit of a love-hate relationship with water) and it was the perfect refreshment after 10-and-a-bit miles. I strolled in to the biggest cheers I have ever heard from my fellow Harriers, who had all finished and were stood on the other side watching. 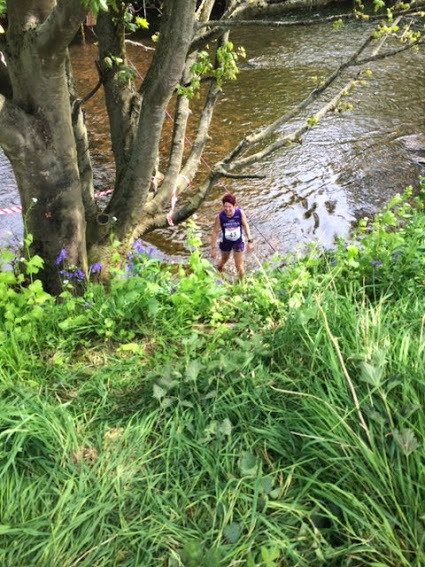 The marshal in the middle of the river told me that I should run and pick my knees right up, so I did as I was told and splashed through. So much fun! A final scrabble up the bank and a sprint on the playing field and I was done! We got a goody bag with choccy, water and banana, plus a bar towel with the Bluebell Trail logo. A fantastic race all round and definitely on my list for next year and beyond. 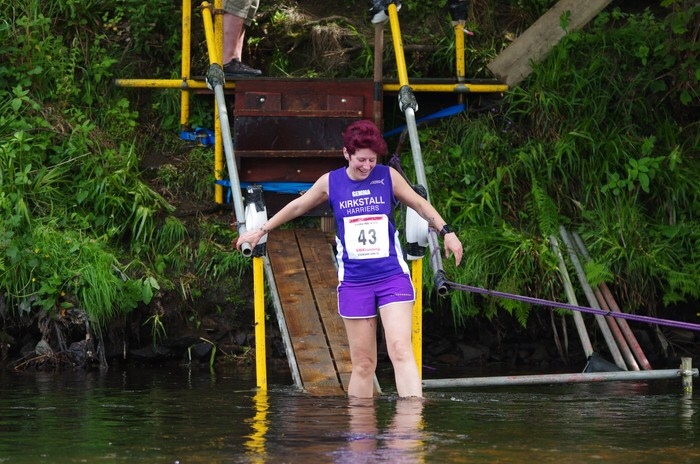 Many thanks to the Lions organisers and marshals, and big thanks to Geoff Matthews for the fantastic photos of me crossing the river. What a happy runner I am! Marathon training: What if I’m doing it wrong? I’m starting to think I’ve been missing something out of my training, or that I’ve been running everything too slowly. Or just doing it wrong somehow. Having completed all my long runs now, the most recent being 21 miles on Sunday 23rd (preceded by 3 miles on the Saturday and followed by 5 miles on the Monday), I’m in the process of tapering. Over the next few weeks I will be running just as often, but the notable difference is that the long runs are practically non-existent compared to recent weeks, dropping to 12 miles this weekend, then 8 miles next weekend. The weekend after is London Marathon, in case you can’t guess! So, 13 weeks into training, and I have run just under 337 miles. I’m not knackered. I’m not even that tired. Nothing hurts or feels like it’s going to drop off. I still have 10 toenails, and they are all a normal colour. My head is not mushy and I’m not gorging on all the carbs in sight. All I want to do is run. And run. And then run some more. By now I was expecting to be fed up of running, to hate the thought of doing any more miles, and to be too tired to do anything except moan about not being able to touch my toes or stand up straight. I thought I would be broken; crying out for a rest and bursting out of my clothes. In actual fact I feel amazingly strong and ready for it. Famous last words? Quite possibly. But I’m very happy that I feel so great. There are still three weeks to go, so plenty of time for things to go wrong. And although the distance doesn’t scare me I’m not sure how I’m supposed to magically run it so much quicker than I have been doing in training. I’m told that adrenaline, crowds and a bit of sheer willpower and determination will make it happen. And in the end I suppose the thing to remember is that April 13th is the easiest and most straightforward bit – all I have to do then is run and enjoy it! The first in an occasional series on things I ponder while running. Long slow runs are an excellent opportunity to have a think. I also debate with myself and write poems in my head. It’s not always deep and meaningful, or even interesting, but I try to remember at least some of it. Today I did 9.5 miles on the footpaths, up to Rodley and back along the A65. Not a particularly inspiring landscape it has to be said, and for the most part I was tuned out of everything except the movement of my body, but I did have a few thoughts. How much “stuff” is there in the world? How many people are in factories and workshops right now, making stuff for other people? Why do some people think that rules/common sense don’t apply to them? Why is this hill so damn long? What does it feel like to be transported on Star Trek?